Well, it first started out to be a 3-5 inch snowfall, then less than one inch, then back to 3-5, and when it finally arrived, 12-14 inches of snow. 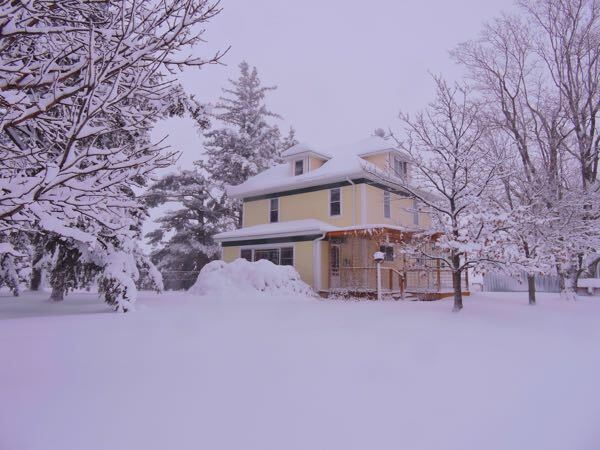 The house nestled in the new fallen snow. 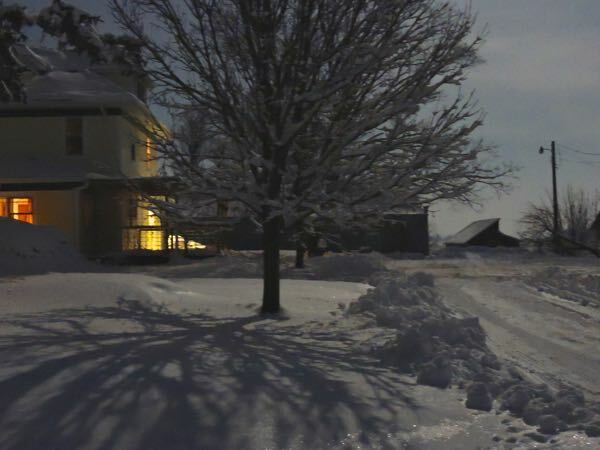 Along with the fresh snow, the moon was full, making for brilliant light-filled nights. 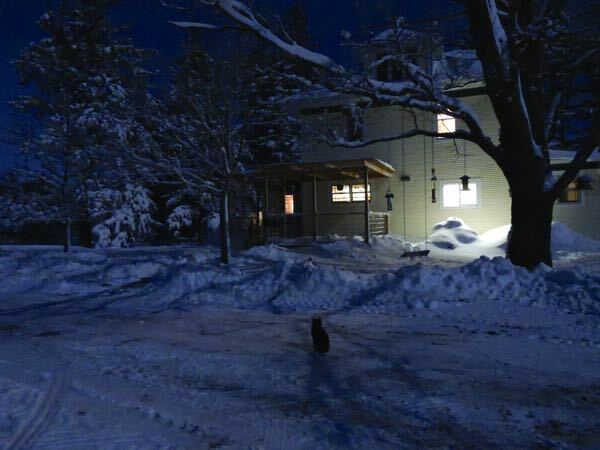 Can you find the cat in this photo? The cat abides, and follows me in the night, hoping for a treat. Finally one more shot in the moonlight. 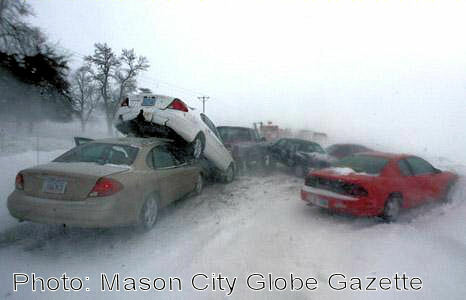 December 9, 2009 – Storm of the Century? 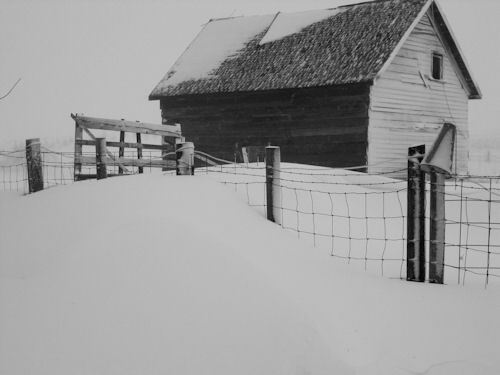 Word from the weather service is that the current blizzard is the 2nd biggest in recorded history in the state of Iowa – not able to beat an 1880’s storm. The criteria for “biggest” means the most snow over the widest area. We’ve had bigger storms here on the farm in the last 13 years, but those storms were more localized than this one. 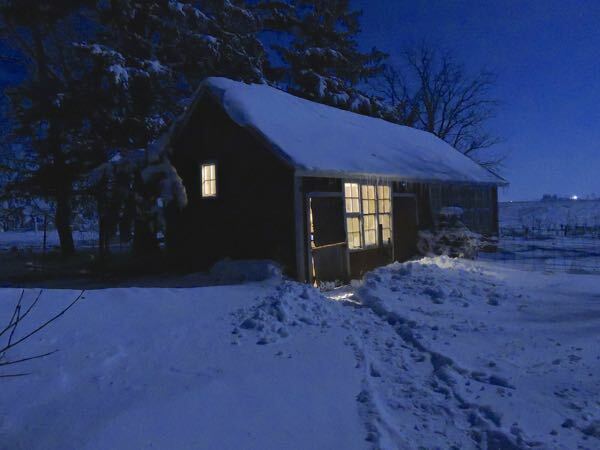 This storm left a wide swath of snow over a foot deep across most of the state. 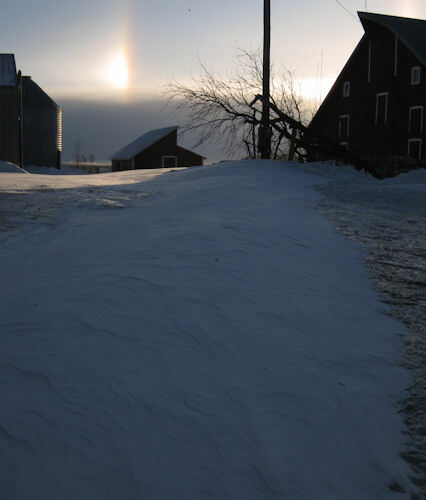 The snowdrifts are almost over the fenceposts by the back pasture and buried a hay wagon. 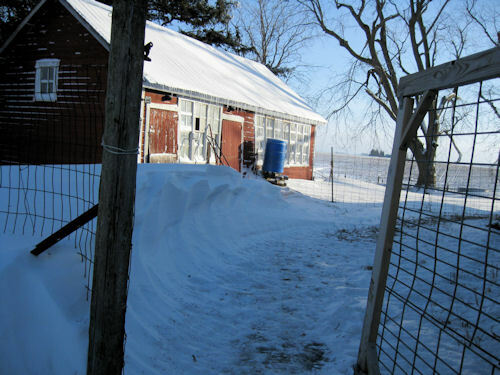 The door to the chicken coop is pretty much drifted shut! However, we’ve had much bigger drifts in previous years. 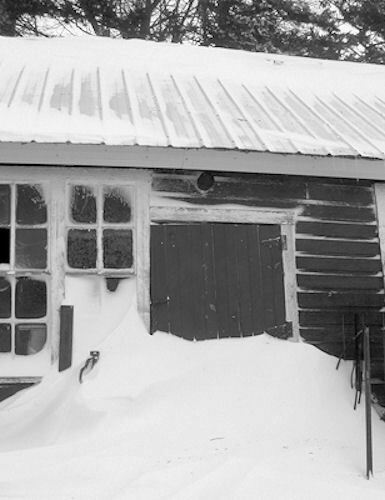 No school for two days for the kids – now that the winds are down to the 25 mph range and the blizzard warning has passed it is not nearly so blustery, but the temperatures are plunging below zero tonight. 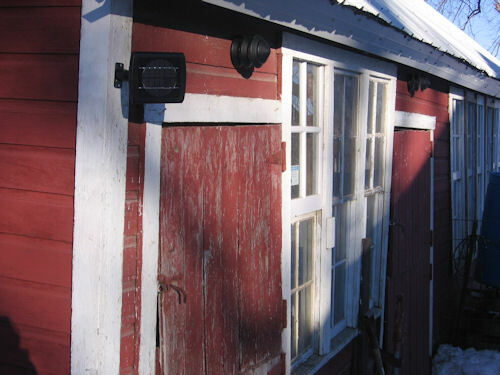 I just mounted the small solar panel and the lights over the doors, instead of in the ground as designed. Now, the girls will have at least a little light to guide them to the coop at night. It seems like the leaves are really reluctant to turn this season. I’m not sure if it is the warm, moist fall – we really still haven’t had the temperatures drop into the 20’s yet this season. Today I got a dose of the legendary Menards customer service. My steel siding/roofing was in, so I went to town to pick it up. 1)Â Show them my slip at the service desk, they call the back for a load out, no one answers. 2) They try again in a few minutes. No one answers. Wait. 3) They try a different department. No reply. Wait. 4) Try calling again. Still no answer. Wait. 5) Finally, they find someone with a pulse and have me sign the handheld checkout contraption. The battery dies. 6) The person who was in charge of the sign-out device tells me she “isn’t authorized” to put a new battery in. 8) Finally, someone at the proper authorization level replaces the battery and instructs me to drive around to the back. 9) No one is there, and when someone does appear, they are not able/authorized to drive the forklift. At this point, I’m ready to get something done, so I show them my truck and say I’ve got to go run some other errands, so I go buy some new shoes as my farm shoes have needed replacement for a couple weeks. 10) When I return, the truck is loaded, but there is confusion about whether they sent the right amounts of each color I ordered. At last I suggest I’ll just go home and let them know if I’m short. I spent a good part of the afternoon unloading the pieces, almost a ton’s worth – for the roof of the hog barn, some of the walls of the hog barn, and the east side of the corn crib. This afternoon’s main jobÂ was cleaning out a winter of “processed” chicken food and bedding from the chicken coop. Linda decided to splurge and get a new pair of boots. I can only imagine the tight advertising copywriting that led to the impulsive purchase of these beauties. These boots boast the color of black patent leather made of a 100% neoprene high-top that sit atop a 3/4 inch heel. The high-cut vamp features a rolled edge design (to allow your foot to slide easily into the boot without snagging your hose (water) onÂ slippery mud. 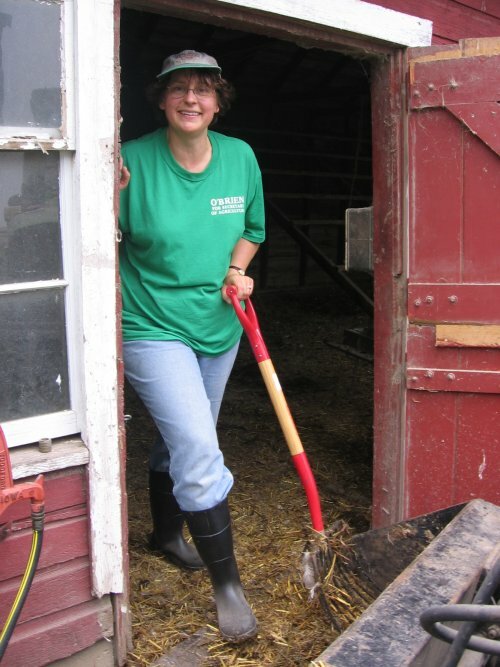 The suede-like leather heel lining cradles your heel while preventing slippage on wet manure. If you prefer “a little more boot” to cover the sides of your feet when the going gets deep, this is your best bet. Claire had to be at school for a band thing at 5:45 am and Emma had to be at her school at 6:45 am. So we had a full day of work today. 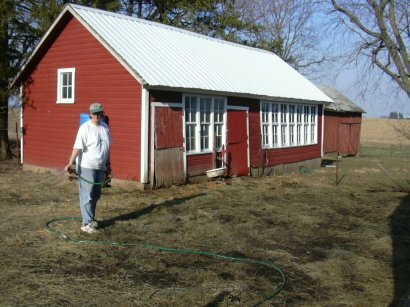 The hen house is all clean, bedding hauled away and doused with water to start the composting. 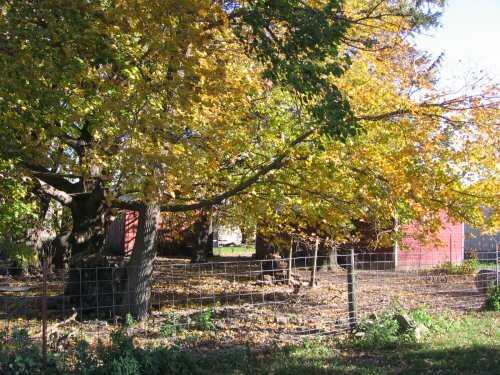 I was able to get some temporary fencing up in the back pasture to let the goats roam wide, and finished applying the last of the wood chips on the property and only have about 20 pine trees left. Linda got the brooding room all ready for the 125 chickens that will arrive on Tuesday. Hawkeye faithful can go back to the store and return the “IS Who” t-shirts after mighty the Iowa Hawkeyes fell to the Iowa State Cyclones 23-3. 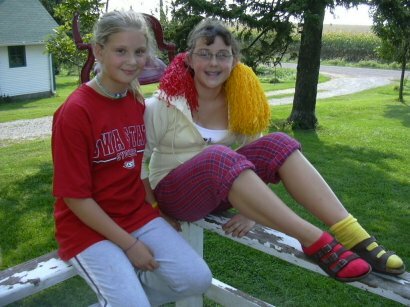 Here are the girls with their game day attire. 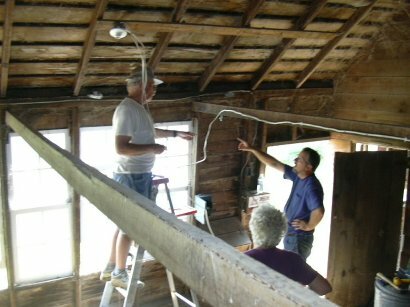 But much more important than the game, was Grandpa Dave’s complete rewiring of the chicken coop, including complete tear-out of existing wires and fixtures. We added a fuse box, outlets, and lights to a side that had no lights. Now after-dark egg-gathering will not require as much angst. In addition, we will have an additional place to brood chicks. May 18, 2005 – Coop Renovations! It’s good to reflect on things that have been completed. 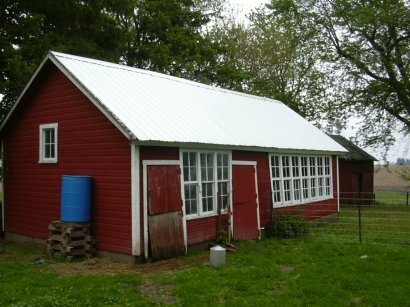 The coop was re-roofed, re-stained, new doors, all the junk hauled out of one side, all new windows and walls straightened. The chickens are in exploring their new turf. 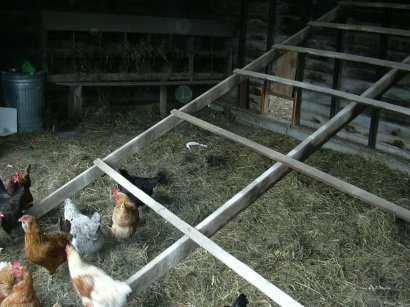 There are two sides to the coop – one is about 1/4 of the space, the other 3/4. All the junk was in the big side and that’s where the chickens moved. I made serious progress in the kitchen today – probably about 75% complete putting up trim around doors and baseboard. Ran out of wood and time, but had a good run at it. April 3, 2005 – Light! Now things can happen after dinner outside! Today 10 of the chestnut trees found a home but need to be mulched yet. We continue digging out Martin’s playground and moved the dirt to the chicken yard which has become denuded of grass, in part due to the trenching for new water a while back. So we laid down a thin layer of soil, and spread some grass and clover seed and some hay. Linda had a meeting with a woman who received a grant to help entrepreneurial immigrants get started in agriculture. There was not a big turnout as expected because there were fears the INS was around and people, even legals, were keeping a low profile. Seems the INS and Swift (the packing plant) have a cozy arrangement. Swift hires illegals, doesn’t pay for health benefits employees for the first 6 months, the INS comes in or is rumored to come in, large numbers leave, and when they come back, they start over for seniority and benefits.